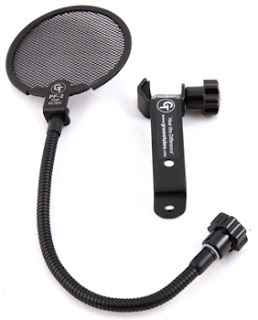 Not all pop filters are the same. The standard mesh ones are fine at first but eventually they wear out and start to smell from everyone singing into them. The Groove Tubes is designed with a stretched mesh steel that diverts air at a 35-degree angle. It forces any extra air energy up to be diverted, avoiding air contact with the diaphragm. It does this without filtering the frequencies of the sound on its way to the mic. A wonderful thing that will last for years to come. At $29.00 it is a steal. *Louvres the air at a 35 degree angle downward away from the microphone capsule. Artists and bands don't forget to submit your music to these two radio networks.